In order to adequately plan for your retirement – both in terms of your lifestyle and the money needed to provide for it – you must consider the change in your living expenses during those years. While it is estimated that you will need to replace around 80% of your pre-retirement earnings to keep the standard of living you have had thus far, planning for retirement is a bit more complicated. For example, you will need to estimate your basic costs of living, consider your individual circumstances, and determine the activities you wish to participate in during retirement. Start by looking at what expenses you incur now for your necessities. Consider your costs for food, clothing, utilities, health, home, insurance and taxes. What expenses might increase at retirement, and which ones might go down or even be eliminated? Will you be cutting down on your food bill with more meals at home, or will your budget need to increase for nights out on the town? Will your utility bill go up now that you are home more, or are road trips in your future, necessitating an increase in your fuel allowance? What about health care? Will you provide for your own insurance or will you qualify for Medicare? If using Medicare, remember to consider the deductible and premiums when considering the various Medicare plans. What about your annual trips to the dentist and eye doctor? If your employer covered or contributed to these expenses, you will need to do a little research to project the cost of these services. Hopefully when you retire your house will be paid off, but if you plan to stay put, remember to continue to account for the costs of your homeowner’s insurance and taxes, and any homeowner’s association fee and its likelihood to increase. You will also need to budget for any home maintenance. The older your home gets, the more important it will be to make allowance for unexpected repairs. Will you plan to continue to do your own yard care and snow removal, or hire out that service? If your future plans consist of downsizing your home, consider how that could impact your balance sheet at retirement. Will the sale of your home give you an added cushion for your retirement years, or do you need to plan for extra costs and fees associated with living in a retirement community? The costs associated with your plans for housing may be one of the largest changes to account for when determining your retirement costs of living. Planning and projecting for these costs can help with your overall retirement plan. Ideally at retirement, you will continue to maintain a 3-6 month emergency savings. 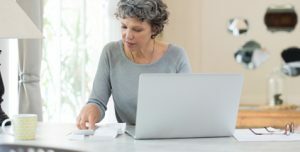 This may be even more valuable to you at retirement when you are on a fixed income and may not have other options to bring in money and pay off debt. If you rely on investments in stocks or other equities for your emergency fund you risk being forced to sell assets at inopportune times such as when the market is down. Keeping an emergency savings in an easy access account will keep the fund available to you if needed. Your living expenses at retirement will be unique to you considering your individual circumstances. For example, the average retirement age in the U.S. is age 63, however, there is more to the story. According to a study from A Merrill Lynch Retirement Study conducted in partnership with Age Wave, nearly half (47%) of today’s retirees say they either have worked or plan to work during their retirement. But an even greater percentage (72%) of pre-retirees age 50+ say they want to keep working after they retire. Your plans to continue to work, or come back to the workforce after retirement, could really change how to determine your living expenses when you hit retirement age. For example, even part time work could secure health benefits from an employer. However, you will still need to consider taxes on this work as well as any taxes owed from any retirement savings you may draw, such as those from your 401K, or Traditional Roth IRA distributions, as well as income limits in drawing your Social Security check. Other circumstances to consider when determining your expenses is where you live when you retire. In fact, if you are looking for an adventure and want to get the most of your retirement savings, check this out: the Bureau of Labor Statistics data on average consumer expenditures for Americans aged 65 and older, and using three indexes used to track the cost of living, GoBankingRates, created a list of 50 of the cheapest places to retire. So, if a fixed income is a concern, you may want to consider trading in the pristine beauty of the rolling hills of New England for the historic sites and tax friendly model for retirees of San Antonio, home of the Alamo. Finally, to determine how your expenses might change in retirement, you really need to envision what you want to experience in your golden years. Do you want to be active and adventurous, or are you content to work in your garden and play with your grandchildren? Are you ready to travel the world and experience fine cuisine, or does your retirement vision consist of being a docent at the neighborhood museum or art gallery? Your vision of what you want to experience in retirement will be the key in determining your living expenses and the necessary financial planning to make it happen. How much does it cost to retire? That all depends on you and what your vision is for your future. Remember that retirement is the time of life when you get to choose how you will spend your time and your money. Taking some time to visualize your future and the way to make it happen, will start you on your path to the retirement of your choice. Our retirement planning calculator will get you started on that journey.